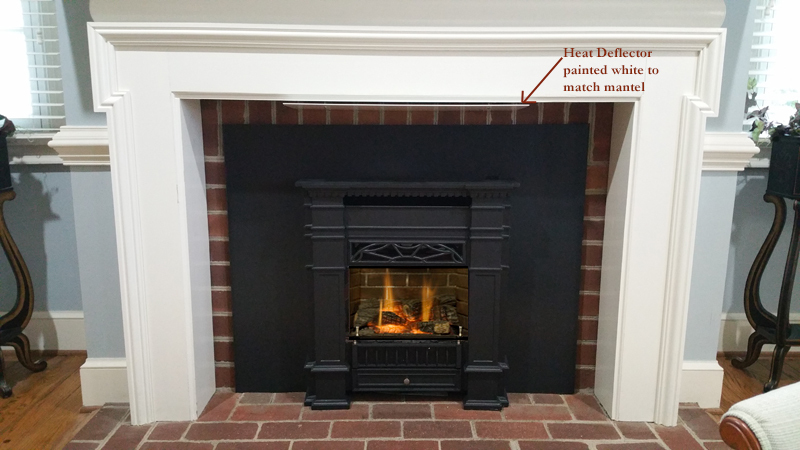 This customer has a Senator gas insert in the family room but wanted to install an insert in the master bedroom fireplace, a later addition to this farmhouse and a room that stayed too cool in the winter. If you look closely, the mantel presents a clearance dilemma. First, the mantel is way too deep, protruding 8" from the fireplace. 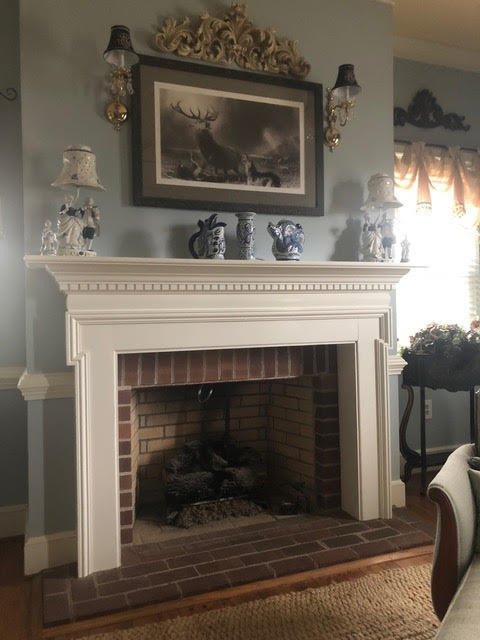 Second, the mantel is way too close; codes require 6" from the side of the fireplace opening to any mantel trim and 8" to the top. Remembering that a brick is 8" wide, the mantel is way too close to the opening with just 4" clearance at each side and 6" from the top. After reviewing every insert we sell, the Senator was the only insert model that would work with these close clearances. After installing it the homeowners were still concerned because the mantel was quite hot to the touch even though we (barely) maintained the required clearances. Mike fabricated a metal heat deflector and painted it white, and installed it just below the mantel so it's unobtrusive. A heat deflector is installed to provide air space between it and the wood mantel, and it's bent at a 45 degree angle to deflect heat away from the mantel. It turned out great! It does its important job and is barely noticeable.